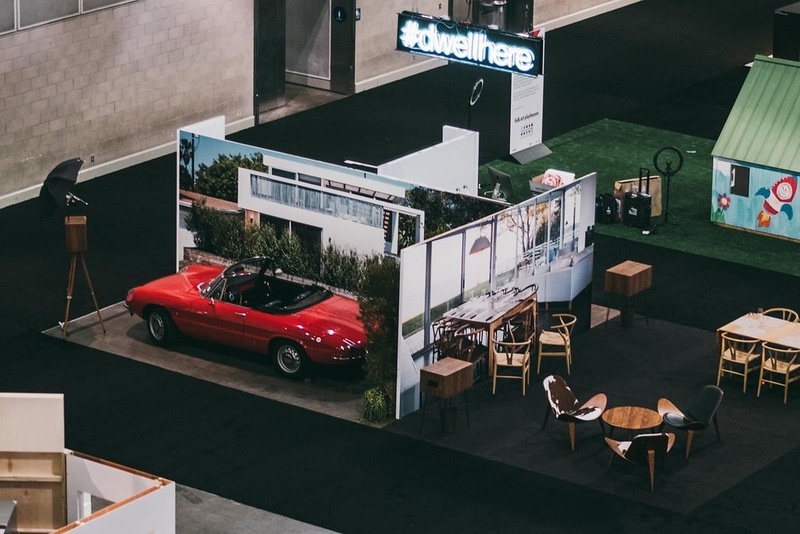 Right when you enter the show floor of Dwell on Design LA, you’ll see our immersive booth that brings to life four vignettes from the pages of Dwell. Stop by to learn about the new Dwell and to take a photo that you can walk away with. Sitting in front of an enlarged photograph of a house in Venice from the June 2016 issue is a 1966 Alfa Romeo Duetto Spider provided by the Petrolicious Marketplace. Make sure to share your favorite moments from the show by using #dwellhere—we'll be doing the same on the platform. The ride is actually for sale through the Petrolicious Marketplace, where you'll find a curated selection of vintage and rare car listings. Along with providing all the information you need to know about the sale, they tell the story behind the vehicle by sharing its background, history, and iconic imagery. Find out more about our featured Alfa Romeo Duetto here. From the Twitter House that we featured in the November 2014 issue is a living/dining space that acts as the backdrop for one of the other vignettes. With furniture provided by Carl Hansen & Søn, the dining environment seems to blend right into the image. In the lounge area featuring Shell Chairs by Hans J. Wegner for Carl Hansen & Søn, we’ll be walking visitors through the platform and helping them sign up on the spot. The carpet tiles are provided by FLOR. The bedroom contains a Kali Duo wall bed system from Resource Furniture and more carpet tiles from FLOR. It folds up into the wall and matches the bed in the image that was originally seen in the Schmidt-Friedlander Residence from the September 2014 issue. Finally, the bathroom holds a Neorest freestanding bathtub from TOTO. You can actually get inside the tub and pose for a photo in front of an image from the Huneeus/Sugar Bowl Home featured in the March 2015 issue. We’ve been busy building a brand new platform that’s created to bring the design community together in exciting ways. For the first time ever, users will be given a place where they can create, discover, and collaborate with a community that’s passionate about design. Now that we’ve launched our public beta, we’re excited to invite everyone to sign up early and begin discovering by visiting hello.dwell.com. Here at Dwell on Design LA, we’ll be giving visitors an in-depth look at the platform where they can sign up and explore four specially crafted photo booth vignettes that we’ve created from landscapes and rooms that we’ve featured in the past. With the help of a number of our partners, we’ve formed an integrated experience that’s like stepping into the pages of the magazine. We’ll be personally walking you through the new platform and showing you how you can become part of the conversation. Once you weave your way through the booth—made up of a combined dining room/lounge furnished by Carl Hansen & Søn and carpet tiles from FLOR, a children’s bedroom featuring a collapsible wall system bunk bed from Resource Furniture, and a bathroom holding a freestanding bathtub from TOTO—you’ll find yourself in an outdoor space boasting a bright red 1966 Alfa Romeo Duetto Spider provided by the Petrolicious Marketplace. After you pose for a picture in front of your favorite Dwell photo with iPad selfie stations provided by Petite Pix, our team will personally help you get set up on the new Dwell. We’ll then print out your picture on Petite Pix printing and social media stations, which can then be used as your profile picture on the new platform. Make sure to explore the rest of Dwell on Design including our Dwell Home Tours program, the Monogram Modern Home prefab that's on the show floor, and the rest of our partners’ booths. #dwellhere will be the official hashtag for documenting these design-packed days. Take a look at the following images that will give you a sneak peek of what you can expect to see at our exhibit. If you’re not able to make it to LA, be sure to become part of the community by creating your own profile at hello.dwell.com. We hope to see you there!